Garbodor is another subject of leaving Standard. And that’s not because of being a Psychic type having 100 HP or it’s underpowered attack, and a retreat cost of three. No, it’s because of the ability alone. Garbotoxin works if there is a Pokémon tool attached to this Pokémon, and it shuts down ALL abilities regardless of Pokémon, which is crazy! Decks that heavily rely on abilities gets crippled for the rest of the game by this Pokémon, and it’ll force deck builders to tech in Field Blower or a tool-Removal equivalent just to deactivate the ability. However, there are some decks that don’t care about their abilities being shut down, probably because the Pokémon don’t have an ability at all, or that they want to get rid of an ability that would’ve cripple said Pokemon (see Regigigas from SM Crimson Invasion). So Garbodor wasn’t the doomsday card that people feared. Heck, even both Weavile cards can 2HKO Garbodor. Overall, Garbodor has an amazing ability but backed with a fragile frame, as 100 HP isn’t long for this world. So what will happen when Garbodor is gone? There’s Alolan Muk to shut down abilities of Basic Pokemon, or Glaceon-GX to shut down abilities of EX/GX Pokemon. These two Pokémon are potent, but nothing compared to how overpowered Garbotoxin was. As for Expanded, Garbodor will continue to cause grief to decks that rely on abilities. Garbodor will rotate out of the Standard format at the end of August, and its departure leaves us in a place that we haven’t experienced in almost six years. 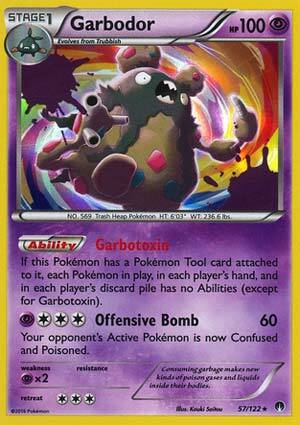 Garbotoxin Garbodor first debuted in August of 2012, and we haven’t known a meta without it since then. Most recently, it has seen little use. It was the 19th most common Pokemon between May 19th and June 23rd (although it won NAIC with Zoroark GX) and barely represented 1.1% of the total Pokemon played, appearing in only 17 out of the 160 decklists available to me. You know, I heard about that Zoroark GX Garbodor BKP pairing and thought it was absolutely nuts. I seriously thought that was the worst possible card you could put with Zoroark GX. It seemed to me that Garbodor might be the only card that doesn’t go well with Zoroark GX. I guess that proves just how good Zoroark GX is, and it was a fitting send off for Garbodor, to win the last major public Standard tournament it was legal for. A good way to go out for a card that impacted the game for so long.